The Fujitsu STYLISTIC Q550 is a business-class slate PC designed for the high-security requirements of mobile enterprise computing. The STYLISTIC Q550 is equipped with a next-generation Intel® ATOM™ CPU that is highly-compatible with Microsoft Windows® 7 operating system, energy efficient, and features superior performance. 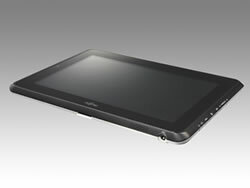 By making full use of Fujitsu's proprietary power supply control functionality, the new series provides effortless operations using a large-capacity battery that can power the slate PC's 10.1 inch screen while still lasting approximately 10 hours.